K’ima:w Medical Center, located in the beautiful Hoopa Valley, is a special place. Check out this short video that showcases some of our people, culture, and amazing terrain. It’s a short video…and a real treat! Measure Z has been a good friend to emergency services for the Willow Creek community. Thank you for helping us fund this ambulance for the residents and guests in greater Willow Creek! 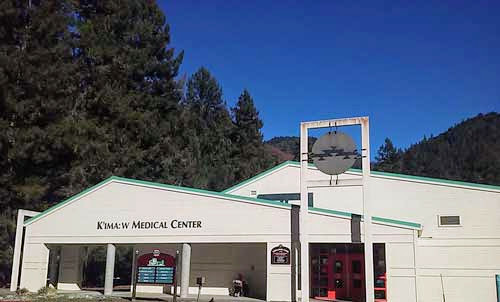 K’ima:w Medical Center, a robust ambulatory healthcare service for the greater Hoopa Valley, has been in operation since 1974. The medical center is accredited by The Joint Commission, an independent, not-for-profit national body that oversees the safety and quality of healthcare and other services provided in accredited organizations. For years the tribal health clinic was called “Hoopa Health Association”. The name was officially changed in 1998 to K’ima:w Medical Center. K’ima:w means “good medicine” in the Hoopa language. The mission of the K’ima:w Medical Center is to provide high-quality health care to the Native American people and all others who may seek the service we provide in the Hoopa Valley Indian Reservation and surrounding area. In service of its mission, by continuously improving the quality of our service, K’ima:w Medical Center will be the best and most qualified health center for the Hoopa Valley and surroundings, the primary force in improving the quality of life of our people. Closed for the morning on the 1st and 3rd Wednesday of each month. Step 4: Confirm that the numbers read back are correct. If so, push 2. Step 5: Enter your phone number or simply hang up. Note: Prescriptions with no refills may take up to 3 business days to process. For controlled substance prescriptions, you must leave a detailed voice message. You can check to see if a prescription is ready by typing in the prescription number on the automated system. Please bring all insurance information to the Pharmacy. If you would like a proxy (person)to pick up medications, you must first come in person to the Pharmacy to fill out a consent form. Verbal permission phone calls will not be accepted.